This is a new favourite. I came to it by accident via the text of Quentin Blake’s excellent lecture on the role of illustration from this years Hay Festival. It is another of those books where the power of it lies less in the words than in the interplay between word and picture. Professor Dupont owns ten cockatoos who live in his conservatory. Every morning he follows the same routine, getting dressed and ready before throwing his arms wide in the conservatory and saying “Good morning, my fine feathered friends!” The cockatoos (perhaps not unreasonably) become sick of hearing the same words every morning and escape to play a trick on the unsuspecting Professor. There follows what (to judge from the hysterical laughter) is a highly entertaining game of hide and seek for the reader. Professor Dupont goes around his house looking in every room, trying and failing to find his birds. The text regretfully notes the absence of cockatoos. However, the cheeky cockatoos very much ARE there, and visible to us if not Professor Dupont. The irony is simple but delicious and the increasing absurdity of “there weren’t any cockatoos there” becomes laugh-out-loud funny very quickly. There is little text to comment on but the illustration is superb, even by Quentin Blake’s high standards, and the simplicity of the premise is what makes it work so well. Some pages (notably the four cockatoos underneath the bath, and the above picture of the six hiding behind attic suitcases) are just a joy to look at. There is a chance that very young children will not ‘get’ this, but certainly from age two to five I would think this is a great book to return to again and again. This book is as old as me. 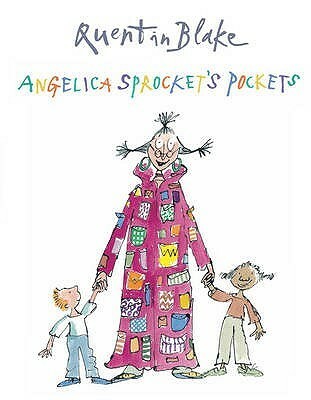 First published in 1980, it is one of the best of the books written by Quentin Blake, who is most famous as the oft-times illustrator to Roald Dahl. This is great fun to read. The absurd things in Mister Magnolia’s possession, all rhyming with boot, are delightful and of course beautifully and wittily illustrated. The tiny mice marching past as he takes the salute are gorgeous. And there is a kind of pathetic fallacy at the end as, depressed at the lack of a boot, Mister Magnolia stares out of the window at the rain and dull people hurrying past with umbrellas. At the moment when he puts on his new boot, the sun is brightening and a man smiles at the sky, taking down his umbrella. There is artistry and depth at work here. For me, the most glorious aspect of this story is the fact that Mister Magnolia gets one new boot. Not a new pair of boots, but one new boot – that doesn’t match the old one. That additional touch of the absurd is what lifts this story to classic status and has ensured it is now on its second generation (at least) of young fans.